Blog Appetit: Buffaloed Chicken Won't You Come Out To Dinner Tonight? Buffaloed Chicken Won't You Come Out To Dinner Tonight? I must have been living under a rock or something, because I had Buffalo chicken wings for the first time just a few weeks ago. In my defense, I don’t often eat in the style of restaurant that is well known for the snack and I try to eat lower on the fatty scale (unless it involves chocolate or paté or …). Whatever the reason, I didn’t know what I was missing out on. Once I had bitten into the dish I was smitten with it and its astounding contrasts of tastes, textures and temperatures. I love blue cheese and I love hot sauce. How could I have missed this??? Now that I am a Buffalo wings virgin no more, I set out to make a version I could actually eat on a regular basis. The result was Buffaloed Chicken. No, it is not the same, but it offers the same taste profile without a visit to the cardiologist. This was devised as a dinner dish, but you certainly could make it with chicken tenders and skip the spinach and serve it as an appetizer. Preheat oven to 400 degrees. Line a colander with cheesecloth or a paper coffee filter. Put the plain yogurt in it and allow to drain over a bowl until the yogurt has thickened. 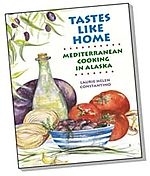 (You can skip this step if you use the thicker Greek-style yogurt.) Melt the butter (use more for a more buttery taste, less if you are trying to watch calories, etc. ), mix with the hot sauce. Paint both sides of the chicken breasts with the mixture. (For a deeper flavor, place in a bowl or dish and let marinate for an hour or two.) Place in an oiled (or use cooking spray) baking dish. Pour any remaining mixture over top of chicken breasts. Add half cup of chicken broth and the minced garlic if using. Sprinkle tops of chicken with salt, pepper and paprika to taste. Put in the oven until baked just through and still juicy, basting with pan juices if needed. If the pan gets too dry as the chicken cooks, add some more of the chicken broth. While the chicken cooks, mix the drained or Greek-style yogurt with the blue cheese bits. (Or make this in advance, it gets better from being made a day ahead.) Steam the spinach and cut the celery stalks into 2-3-inch pieces. 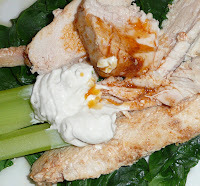 To serve: Place a bed of spinach on a plate, top with the chicken. Serve with the celery and blue cheese dressing. Have hot sauce available on the side. I like to serve it with some of the leftover roasting pan liquid drizzled on top and available on the side for some extra zip and flavor. Try it with your own homemade hot sauce. Click here for directions for my "Below the Belt Hot Sauce"
This post is part of Sweetnicks "ARF" roundup number 102. Interesting idea to make the blue cheese sauce with strained yogurt. I love buffalo chicken and will have to try that idea.